When I learned how to bake Irish cookies, I found they are much like ours here in the United States. They use pretty much the same ingredients as we do; flour, sugar and plenty of creamy butter; also including locally available ingredients like rhubarb. 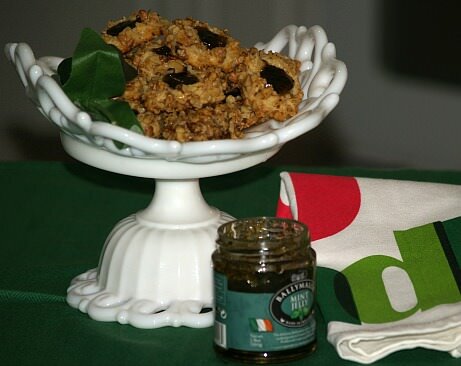 Many of their recipes include rolled oats as ours do; the delicious chocolate Irish whiskey cookie recipe and the lace sandwich cookie recipe with oats are favorites. Learned how to bake Irish cookies with many different sugar cookie recipes. Simply shape them like shamrocks which are always popular. Don’t worry if you do not have a cookie cutter like a shamrock, just shape with your fingers; or still easier make them round and sprinkle with green sugar or frost them green. Anything green is good for St Patricks Day. The first cookie recipe is a favorite Irish lace cookie recipe. When the cookies are cold you can fill two of them with a variety of fillings or you can eat them individually; either way they are good. 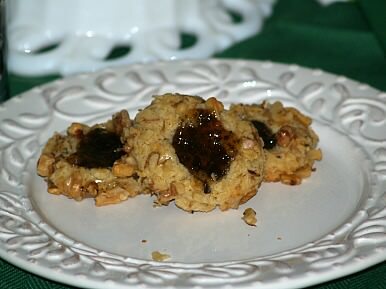 Learn how to make Irish cookies that are good “dunkin” cookies, made with rice cereal, oats and coconut. These are great covered with melted chocolate or icing. I added a little peppermint oil to the melted chocolate. This is a large recipe making about 7 dozen regular size cookies. You can cut it in half. Cream together the butter, sugar, eggs and vanilla on medium speed of mixer; set aside. Combine flour, baking powder, soda and salt; add to creamed mixture. Add the cereal, oats and coconut and mix well. NOTE: This is a very dry mixture so knead it together with hands. Divide dough into 5 balls and wrap in plastic wrap until ready to make to KEEP FROM DRYING. Roll out to ¼ inch thickness and cut into shapes; place on parchment lined cookie sheets. Bake about 12 minutes until light golden brown; frost as desired. Makes about 7 dozen regular size cookies. In a mixing bowl, cream the butter and sugar. Add egg and almond and beat well. Blend in the flour, salt and oats. Roll ½ teaspoonful of dough into balls (dough will spread) and place on a greased cookie sheet. Leave a lot of space between cookies. Bake cookies 5 to 7 minutes. Let set until cold before removing from tray. Melt chocolate and butter. Add the Irish cream and blend. Spread mixture over the flat side of a cookie and top with another cookie. Let set until cool. NOTE: LACE COOKIES can be wrapped around cylinders when they are still warm but not hot. They can be served like this, dusted with powdered sugar or fill with whipped cream. I learned how to bake Irish cookies which are merely Irish because I used “Irish butter” and by appearance. This sugar cookie recipe can be used in any shape or just round circles. They can be iced or sprinkled with sugar. Cream sugar and butter. Add egg and vanilla and mix thoroughly. Blend in the flour, soda and cream of tartar. Mix well and refrigerate for about 3 hours. Heat oven to 375F degrees. Roll out on a floured board. Roll out to less than ¼ inch thick. If cookies are too thick they will lose their shape when baked. Cut dough with a shamrock cookie cutter (or other shape). Bake for 7 to 8 minutes or until only slightly golden. Let cool 5 minutes before removing from tray. When cold ice cookies. NOTE: When I am in a hurry I buy the prepared icing in the grocery store. The colors are bright and pretty. The downside is it is much more expensive. 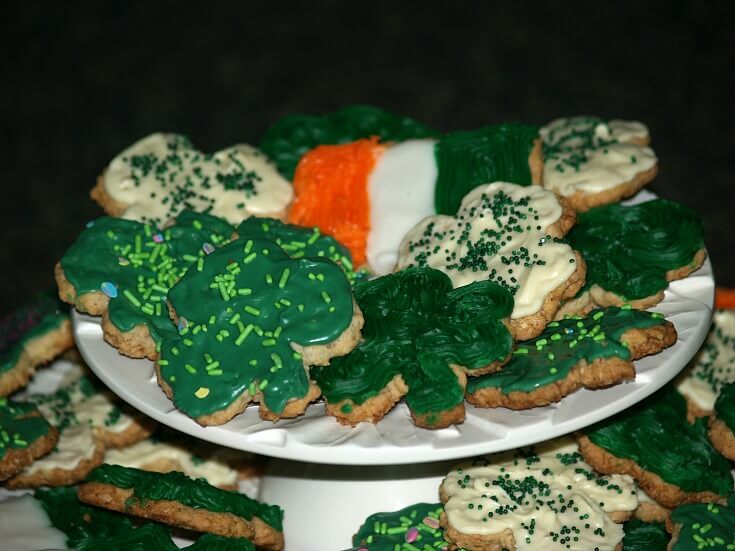 Irish cookies that are shaped like shamrock cookies are always a hit for St Patricks Day cookies. Combine and mix butter, sugar, egg, food coloring and flavoring together. Measure flour and sift with salt; blend into creamed mixture. Shape shamrocks by forming 3 small balls and flatten with fingers; shape stem and attach. Sprinkle shamrocks with green sugar and bake about 9 minutes. Combine and mix butter, sugar, egg yolk and vanilla. Sift flour and salt and blend into creamed mixture; roll dough into balls. Beat egg white with a fork; dip balls into egg white and then roll in nuts. Place balls on ungreased cookie sheet; press thumb gently in each ball. Bake cookies 10 to 12 minutes or until set; fill thumbprint with green mint jelly. Makes 15 to 18 cookies. Rhubarb is plentiful in Ireland so it is used in many Irish dessert recipes. You may not consider this recipe Irish cookies but you will still like these rhubarb bars. Combine and blend crust ingredients until coarse crumbs; press into greased 9 X 13 inch pan. Bake at 350F degrees for 10 minutes. Make filling; combine sugar and flour in a bowl. Whisk in the cream and eggs; stir in the rhubarb. Pour mixture over crust and bake for 40 to 45 minutes or until custard is set. Prepare topping; Beat cream cheese, sugar and vanilla until smooth. Fold in whipped cream and spread over the top. Refrigerate until serving and cut into bars; keep refrigerated. This chocolate Irish whiskey cookies recipe utilizes many of Ireland’s favorite ingredients. 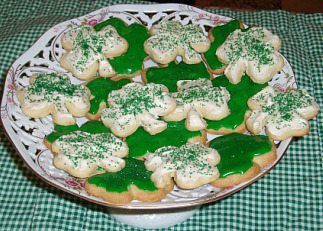 These Irish cookies, along with the Irish lace cookies are a favorite among my Irish friends. Liberally grease and flour cookie sheets. Cream butter and sugar until fluffy; beat in 1 tablespoon of the whiskey. Heat cream just to boiling; stir in remaining 1 tablespoon whiskey and simmer 3 minutes. Remove from heat and stir in chocolate chips until melted and blended. Add HALF of chocolate mixture to butter sugar mixture. Sift together flour, baking soda and salt; stir into butter mixture. 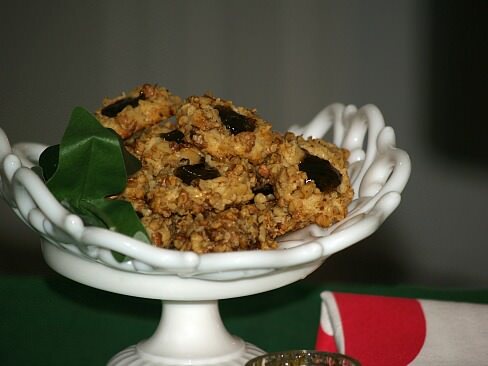 Fold in quick oats and nuts; drop rounded teaspoonfuls 2 inches apart on prepared cookie sheets. When cookies cool drizzle remaining HALF of chocolate mixture across tops of cookies.